The Biodiversity Heritage Library (BHL) received two nominations for the award, which highlighted BHL’s global collaboration among libraries, innovative outreach and exceptional bibliographic and technology standards. 2012 marks the first time an organization has won the Charles Robert Long Award; since 1988, only 14 people have received it. 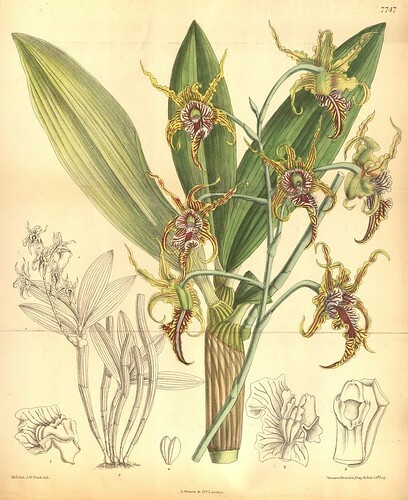 Image from Curtis’s botanical magazine.. London ;New York [etc.] :Academic Press [etc.]. biodiversitylibrary.org/page/450786. The award was announced during the CBHL Annual Business Meeting in East Lansing, Mich. in May. Representatives from the Smithsonian Libraries, Harvard Herbarium Botany Libraries and the New York Botanical Garden accepted the award on behalf of BHL. As part of the honor, the Biodiversity Heritage Library received a certificate and lifelong institutional membership to CBHL. “We hope this [award] will encourage awareness of and further cross-collaboration between natural history libraries and CBHL,” said Laurie Hannah, Chair of the CBHL Long Award Committee. The Council on Botanical and Horticultural Libraries, Inc. is an international organization of individuals, organizations and institutions concerned with the development, maintenance and use of libraries of botanical and horticultural literature. The purpose of CBHL is to initiate and improve communication and coordinate activities and programs of mutual interest and benefit to its membership. available to the world as part of a global biodiversity community. The BHL Secretariat is hosted by Smithsonian Libraries. The Technical Director and portal development team are hosted by Missouri Botanical Garden. Affiliated BHL projects have been established in Europe, China, Australia, Brazil, and Africa. To further explore the BHL, visit http://www.biodiversitylibrary.org/. Congratulations to BHL, and this award is so well deserved! When I was a graduate student in NYC in 1982/1983, I had summer jobs at the New York Botanical Gardens while Charles Robert Long was working there. He and the other NYBG Library staff were an inspiration for me to pursue a career in librarianship. I am so glad to know that Mr. Long has been memorialized by this CBHL award. He was so dedicated and a great administrator for a wonderful library.